I have been reminded a few times that I haven’t completed this series. I apologize for that, but there were some interwebz difficulties while staying in Bol, Island of Brač, Croatia. Simply put they didn’t work so well from my working area. But I am now in Dubrovnik, Croatia and I have the capability to finish my series. Our third (and final) stop before lunch on our Food Experience was a prosciutto ham factory. Much like parmigiano-reggiano cheese and balsamic vinegar of Modena, there is a consortium that oversees the quality of DOP prosciutto. Seriously, it just sits there! 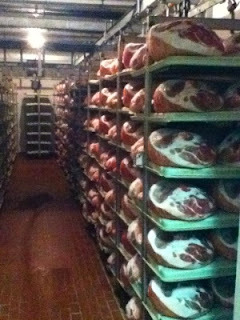 There really was too much to watch at the ham factory because it is mostly just waiting. I had always wrongfully assumed that prosciutto was smoked or heat treated in some way. Nope. Cold, salt, and pig are the core ingredients needed to make this delicious treat. It really was a food education! Back to the process. The prosciutto factory receives fresh pork shoulders each week from a local butcher. There are very specific requirements on how old the pig is, what type of food it has received, and the type of conditions that it grew up in. If there is one thing I learned about DOP products, it is that everything is traceable from the field to the factory so that you know exactly what you are putting in your body. When the butcher drops off the shoulders, the delivery driver waits until each one is individually inspected to ensure it meets the standards of DOP prosciutto. The ones that don’t make the cut are sent back to the butcher and used for other products. Once the shoulders are in the warehouse they are salted and then lots of time goes by. They are moved to different temperature-controlled rooms during the process, but that’s how it works: salt, wait, salt, wait, then wait some more! Unlike DOP parmigiano-reggiano cheese, which is certified by sound, a horse bone needle is poked into specific spots and the aroma is how the certification is made.